Please enjoy though try not to do anything illegal. Please sign my guestbook. I would like to know who has been here. Private message me, if you please. Let me tell you about my weekend so far. Yesterday, we had a graduation party for my brother and four birthdays for my brothers and sister-in-laws. Lots of work. Before that, I had gone to the library to check out some books. I got volumes 3 and 4 of Meru Puri, some hmong folk tales, and Twilight by Stephanie Meyer. I finished Meru Puri. It was a very...romantic story, I guess. It's kinda hard to describe. I read one of the hmong books I checked out and realized I'd read the story before, but I had forgotten most of the details. Then I read about half the book of Twilight. There are lots of things I could criticize about the book so far. For example, the writing is teen novel style. The descriptive writing is really just pointing out the obvious. Some of the description is repetitive and annoying. I keep running across sentences like, "A shock went through my body" or "His eyes..." or "His bronze hair..." or things like that that really get on my nerves. To me, I kinda just wish the story would move on. Anyway, I like the book better than I thought I would as well. The story is actually very funny. I hope everyone knows it is about a love between a vampire and a human girl. Anyway, every time Edward (the vampire) talks to the girl about her or touches her, it seems like he's saying, "You'll be tastier when you have food and sugar in you." or "Good. You're still healthy. I'll eat you tomorrow." or something. Sorry, I just keep thinking of it that way since he's a vampire, I guess. Okay, I guess that's all for today. Have a great day everyone! Thank you for the comment. I'm working on the mural bit by bit. It's really just drawing on paper and then putting it together, but I'm hoping it'll look somewhat cool. So on July 4th, I went to the July 4th tournament. Remember how I said I was a Jay Chou fan? Well,I got his two movies that I like. Secret and Kung Fu Dunk. I watched them online at first, but then I wanted to buy them so that my brothers and sisters could watch it too. Secret is about a boy and girl who meet at a musical school and fall in love. It's really something. There's more to it, but I feel like I'd be giving away the "secret" if I went on longer about it. 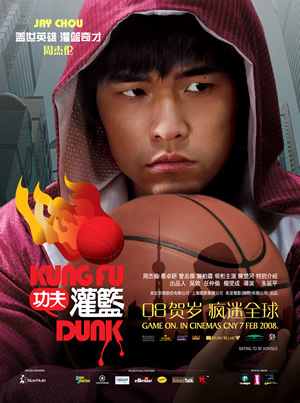 Kung Fu Dunk is about a boy who is in a Kung Fu school. He gets kicked out and someone who finds his talent tries to get him to play basketball. It's a really funny movie. Jay Chou's acting is like he's not acting at all because he usually plays the same character which is the shy boy who happens to have some sort of talent. I like it. Other than that, nothing else is going on. BTW at the soccer tournament, my older sis who was playing and her team got second place for the girl's tournament and her boyfriend's team got 4th for the guys tournament. My older sis and her team thinks they should have gotten first though. I mean, their training sessions are tougher than school soccer and they've got a strict coach. The last time they also got second because the other team got lucky or something. Yeah, in the tournament, they really are one of the better teams. BTW, it was a pretty small tournament. I just remembered. Yesterday was my youngest brother's birthday. Haha. It was also his day to do dishes. We'll be celebrating it on Saturday I think. He's turning 13 even though he looks like he could be 15 cause he's really tall (but really scrawny). Okay, here are the covers of the movies I got. What Howl's Moving Castle Character Are You?